This morning, on-site at Road Atlanta for the running of Petit LeMans, Porsche unveiled to the press ongoing development in the Porsche Intelligent Performance category. Expect a Panamera Hybrid to debut in 2011. Porsche designed the drivetrain components from the Cayenne Hybrid (which has hit US shores with roughly 30,000 units pre-ordered) for future fitment in the Panamera. As if we would expect anything else from Porsche's engineering department. The 918 Spyder hybrid supercar, which has a 0-60 time of sub 3.2 seconds, with sub-compact fuel efficiency, is expected to achieve 78 miles per gallon in favorable conditions. Besides the above average fuel economy, the 918 Spyder isn’t the typical electric hybrid; it also boasts a top speed of over 198 mph and a 7:30 lap time on the venerated Porsche proving grounds, the Nürburgring. The goal is for the Spyder to achieve a 150 mile range on electric power alone. An unexpected announcement today was Porsche’s plan to expand the hybrid technology to the Boxster. The Boxster E – a fully-electric sportscar – is currently in research stages, but is expected to produce a car by 2013. Porsche engineers on hand explained that the mid-engine layout of the 987 series made the most sense when combining with the need of electric peripherals. Capturing the brake energy and storing it in batteries will be much easier with the room a mid-engine car has both in the front and rear of vehicle. Most importantly, this layout allows engineers to maintain weight balance, which is paramount in the handling of the car. This research project is more than concept, as we received confirmation there really are three (3) electric Boxster-Es running around, so if you travel to Germany, keep your eyes open! Today’s star—the famed GT3R Hybrid is on track Road Atlanta, one hour into its much anticipated debut in the U.S. Although its sports undeniable good looks (just look at that wing! ), it is as beautiful inside as it is out. Since its debut at the Nürburgring, Porsche Intelligent Performance engineers have been hard at work evaluating race data, and tweaking the car for today’s race. Previously, drivers had to press a “boost” button to activate a pair of 80-hp electric motors that drive the front wheels. At Petit Le Mans, the GT3R Hybrid has this feature integrated into the throttle, so that the extra horsepower is automatically available (as long as charge is available). This technology, engineers explained, frees the drivers to focus more fully on racing. The boost charge represents about an 8% capture of brake energy. (While that may not sound like much, it is about twice what Formula One teams had available last year). The good news, in the event it is needed, the boost button is still on the wheel to be used at the driver’s discretion, to ensure a pass or prevent one. In addition to freeing up the driver, this technology functions somewhat like traction control for the front wheels. Porsche engineers did not want to tell us too much about this rapidly evolving technology, but they did assert that they can control the GT3R Hybrid’s front wheel speed individually left to right, and that Porsche Torque vectoring is in the future of this impressive race car. 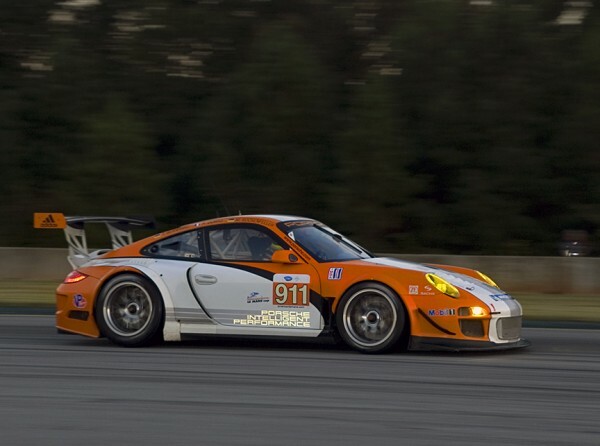 The 2010 running of Petit Le Mans is just underway here at Road Atlanta. Come back often for more information and for real-time race reports you can follow PorschePurist on Twitter. Considering the fact that the Panamera is already one of the fastest 4 door sedans on the market, the hybrid version should completely blow the pants off of everything else in the segment….